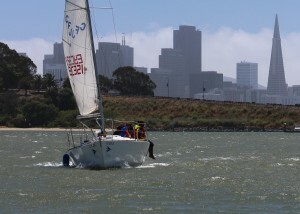 Monday morning’s high winds and cool temperature on Clipper and McCovey Coves were not normal. Didn’t bother outreach groups and students – they love feet dragging in the water and butts on the rail. Nice view from Bay Bridge bike path. When high pressure areas dominate early in the morning, as they did last week, afternoon winds can build quickly into 15-20 puffs. With reefed mains on the J/24s used for outreach kids and proper coaching for the dinghy students Clipper Cove comes alive with smiles all around. The Sunset Neighborhood Beacon Center visits to TISC are part of their summer program which serves 400 youth in elementary and middle school. Chilly temperatures and gusty winds clearly don’t dampen their appreciation of what Mother Nature has to offer on Clipper Cove. Treasure Island Sailing Center, through our own fundraising efforts and the generous donations from individuals and corporate sponsors, enable youths from all parts of the Bay Area to experience the fun of feet dragging in the water. These kids leave TISC with memories to treasure and respect for the world in which we live, a world within easy view of downtown San Francisco and just under the bridge from the Port of Oakland. 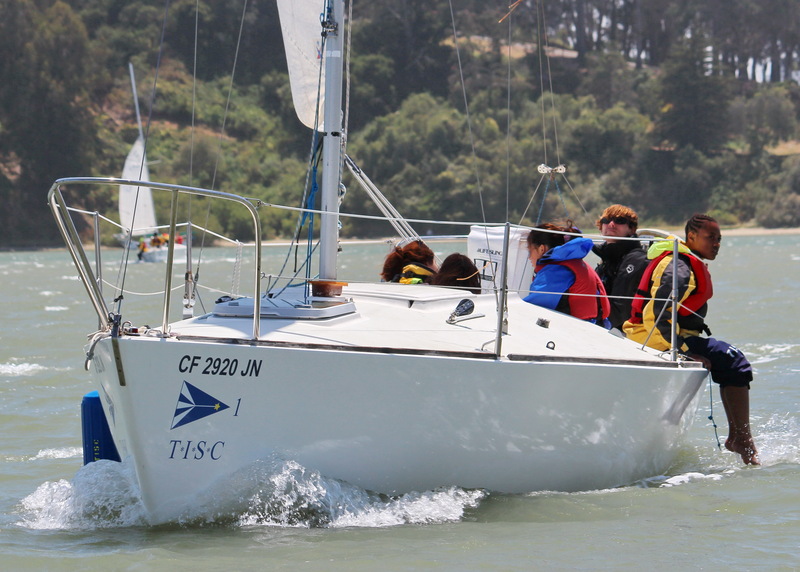 Youth participating in one- or two-week sailing classes at TISC benefit from our top-notch team of experienced instructors, always encouraging and leading students to take the next step. 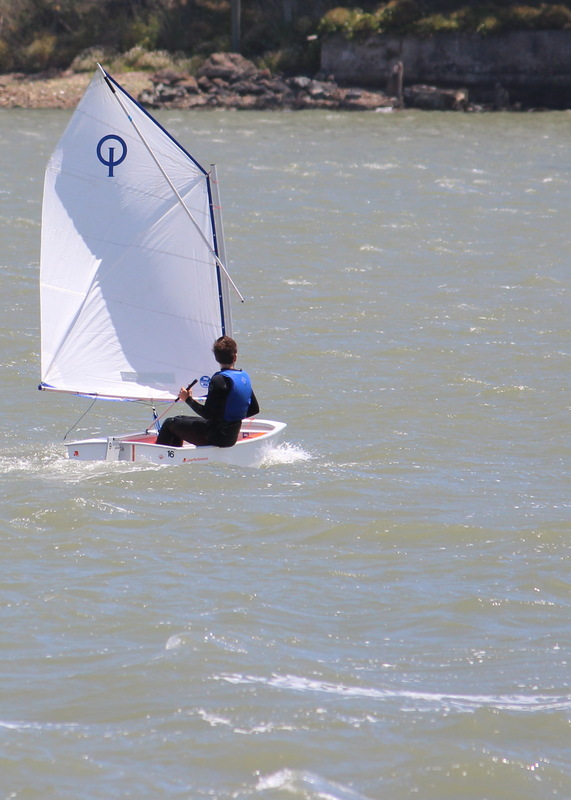 Last week’s windy Monday provided a chance for true seamanship to shine through. Early morning cat’s paws provide ample opportunity for learning about safety afloat, wind direction and capsize drills. 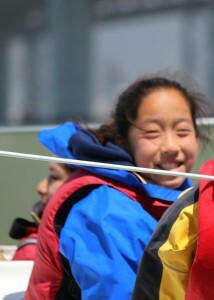 The afternoon breezes can excite youth about sailing and develop higher levels of confidence and self esteem. 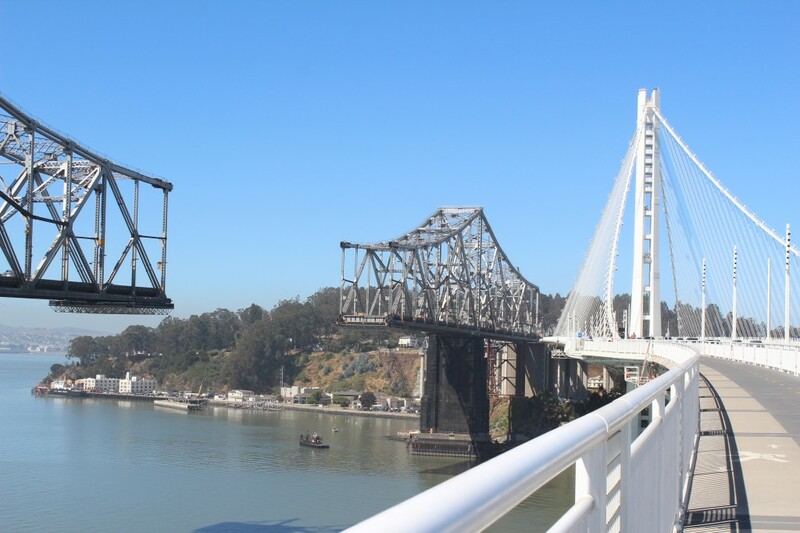 Enter the fun of “butts on the rail” sailing in San Francisco Bay ! Clipper Cove sailing in the morning is often a hunt for whispers of wind. 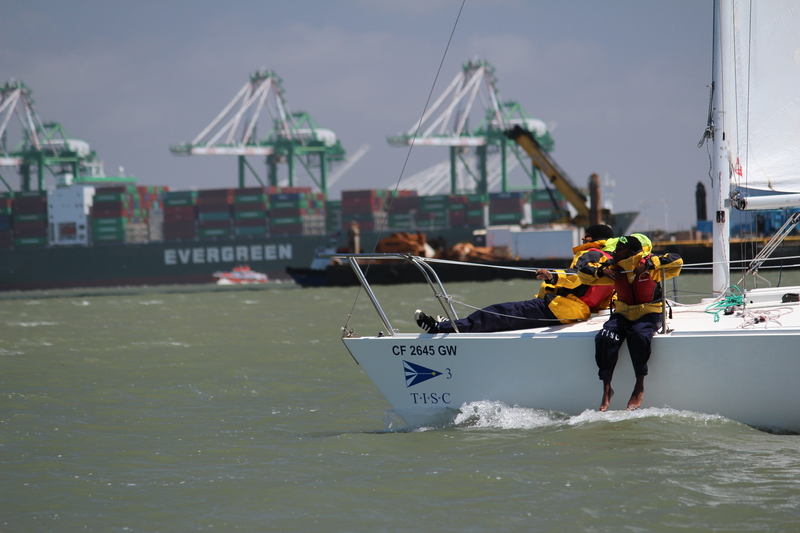 Our instructors use these normal light-air mornings for drills focused on boat handling and teamwork. You can see a video of one of these tacking drills HERE. 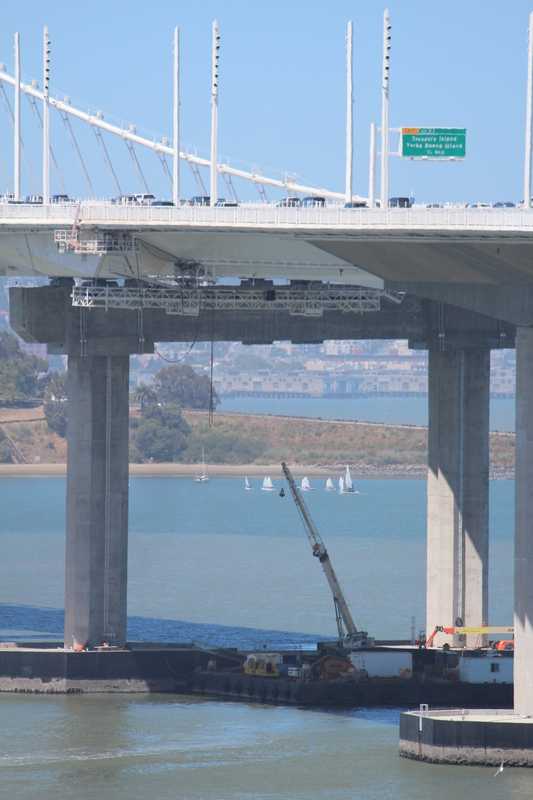 These pictures from last Wednesday morning were taken from the bike path on the new eastern span of the Bay Bridge. We’ve been wanting to check out this path, and were pleasantly surprised how easy it was to access – the entry point is just across Shelmound from the Emeryville IKEA store. 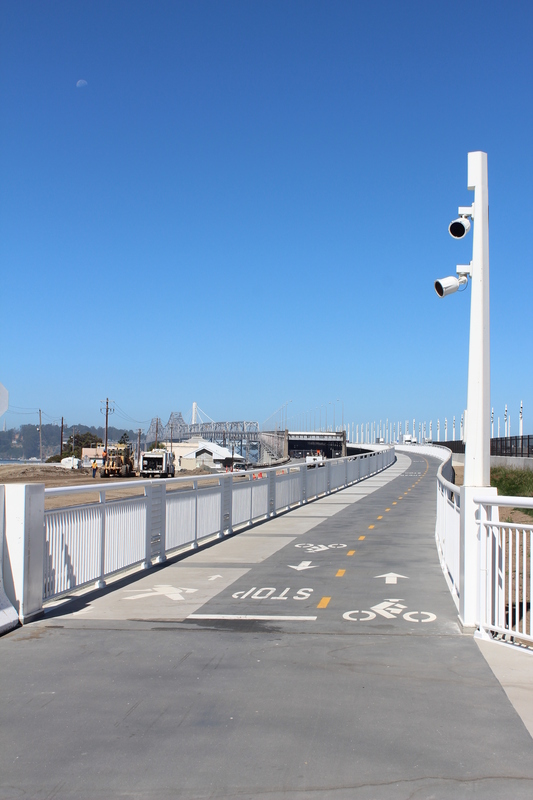 In a year or so this path will enable bikers to drop down to Treasure Island. 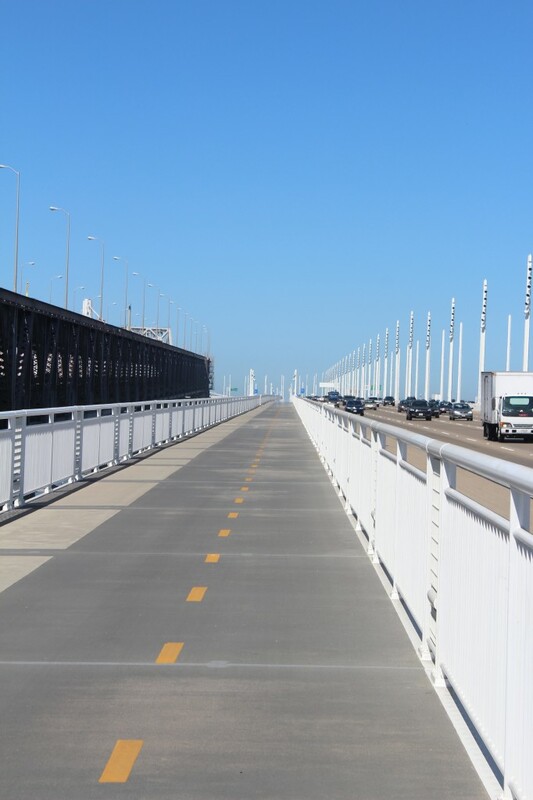 For now the path stops at the top of the bridge 185 feet above the bay. It was windy last Monday over on McCovey cove as well. 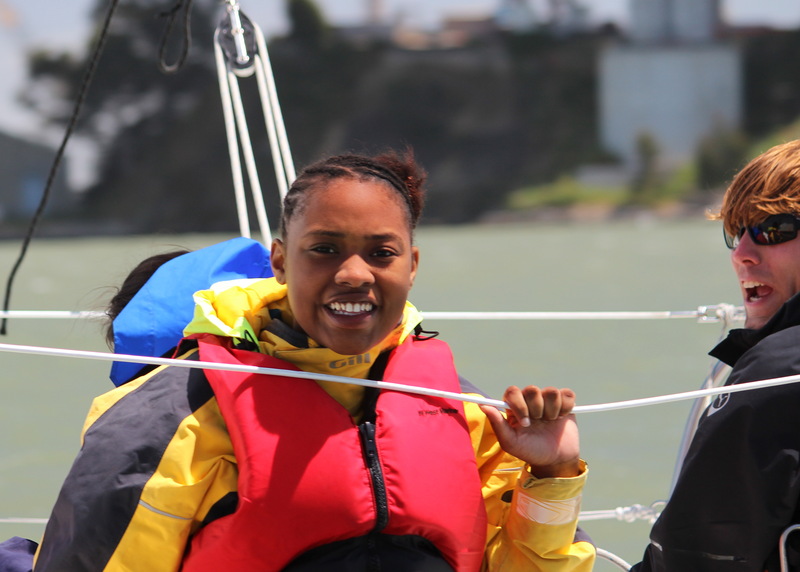 Five youth joined TISC instructors and South Beach Yacht Club volunteers to kick off the inaugural session of the first-ever Co-Able Youth Sailing Camp. 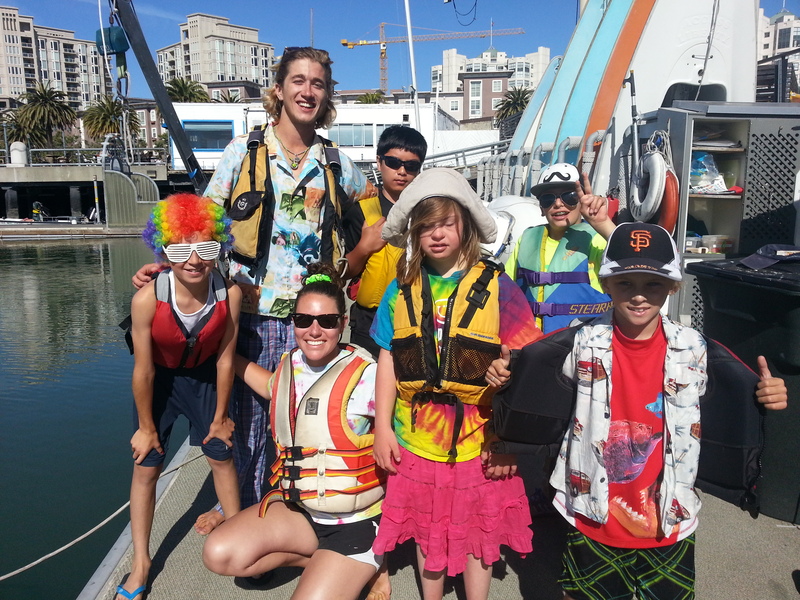 Sponsored by the Bay Area Association of Disable Sailors and TISC, this summer camp will combine students with and without disabilities in such a manner that they will encourage and assist each other to become independent sailors. More McCovey Cove smiles from the BAADS/TISC partnership in a future post. 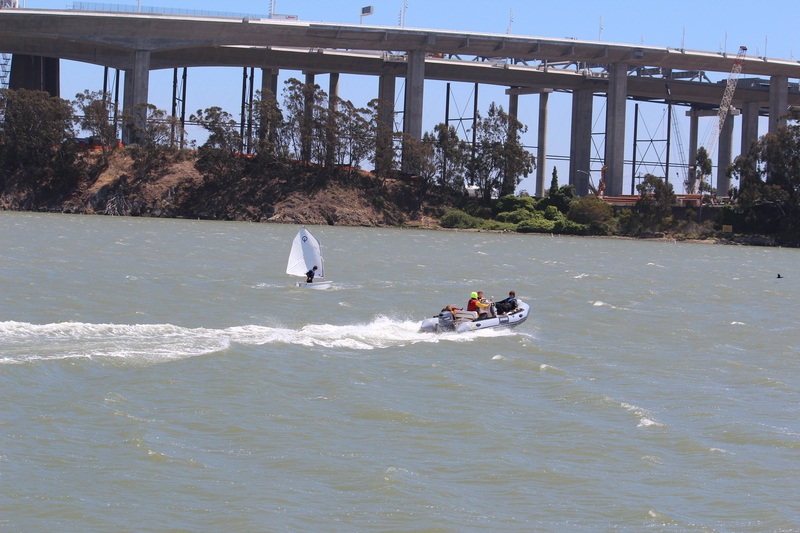 PS – Speaking of windy days, the TISC V15 and Laser fleets race every Thursday evening in the summer. Here are a few tips on how to stay dry when sailing a dinghy in a breeze on Clipper Cove courtesy of V15 Fleet Captain Al Sargent. In the wake: below are a few more pictures from Sunset Neighborhood Beacon District and some taken along the Bay Bridge Bike Path. 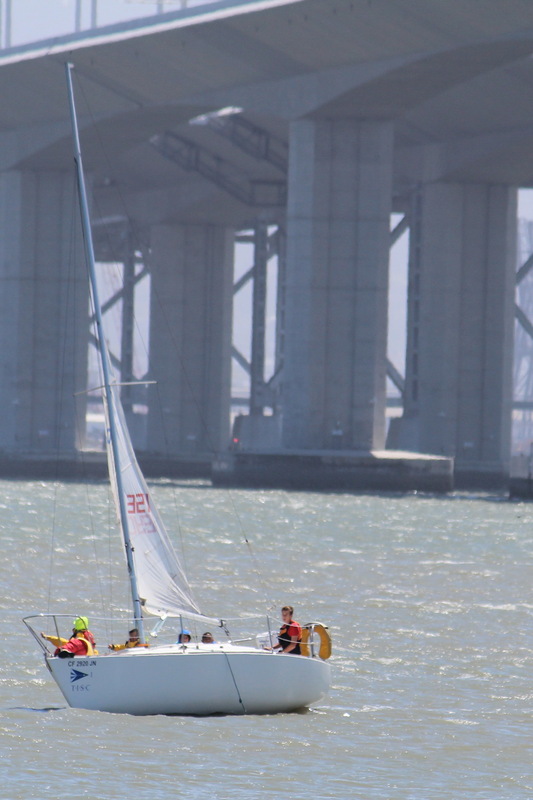 This entry was posted in Uncategorized and tagged BAADS, Bay Area Association of Disable Sailors, Bay Bridge Bike Trail, Clipper Cove, J/24, non-profit, South Beach Yacht Club, Sunset Neighborhood Beacon Center, TISC, Treasure Island Sailing Center, Vanguard 15 by skippersgift. Bookmark the permalink.